A long and somewhat frustrating chase day with a nice ending. Going in, we knew that the setup was the opposite of what we’d been dealing with thus far on the tour: plenty of CAPE yes, but no capping, meaning that the storms were forecast to explode early and quickly become a mosh pit of cells competing with each other and eventually lining out. The shear profile looked good however, so the opportunity for tornadoes was there during the early period after storm initiation. We initially planned on heading to Salina, KS to target storms on the warm front, then adjust from there west as far as need be to meet storms as they formed. By the time we stopped in Wichita for lunch however, we decided that I-70 would be too far north so we started heading towards Great Bend to meet storms that were already developing that were coming up from the southwest. After exiting the interstate at McPherson, we decided to head south to meet storms coming into Comanche County from Oklahoma, taking Rt. 61 towards Hutchison where we got cored by elevated storms in the area as we passed by, containing large amounts of small, very hard hail. As the storms were moving north quickly, we decided that we needed to get west to intercept them as they came north so we headed west on Rt. 50 towards Mackville and Belpre. About this time SPC upgraded the threat in Central Kansas to Moderate with a 15% hatched area all through where we were chasing, and elements of the group of storms to our west, though linear looking, were now tornado warned. As we approached Mackville however, a storm to the south caught our attention so we retraced our steps to Rt. 281 and headed south to Pratt, then west towards Greensburg. The storms were not looking impressive by the time we got there though, and after a long stop in Greensburg we proceeded to meander back and forth between Greensburg and Pratt, apparently killing every storm we looked at. It seemed like the day was pretty well done but then a new series of storms, more isolated than before, started popping up on the dry line from Dodge City south and we turned west again to pursue. We went through Greensburg again, and then planned to turn south out of Buckland on Rt. 34 towards to intercept a storm coming up through Englewood that was all by itself. That plan changed quickly however as a cell to the north of Dodge City went tornado warned, and soon we were heading northwest on Rt. 400 through Ford and then up to Wright to get closer. By the time we made Wright, the storm south of us was tornado warned as well and we were going to have to make a decision which storm to chase. The storm to our north had a nice corkscrew updraft but was clearly undercut, while the southern storm looked linear and high based. We continued to up Rt. 50 through Spearman to Kinsley, and by the time we got there the warning on the northern storm had been cancelled, so we went south on Rt. 183, clipping the northernmost core and ending up under the “whale’s mouth”, with dark tendrils hanging off the shelf cloud that extended the length of the line. We passed through Greensburg for about the 4th time of the day, and got to the southern end of the storm and stopped to observe and stretch our legs. The storm had a decent block wall cloud, but was very high based and also was being undercut, so soon we headed south again, both to check our additional severe storms south of us but also to get heading towards the hotel. The tour had one last show for us however as we headed east of Selman, OK: an amazing mothership of a storm as dusk, showing an array of blue, purple, and orange as we passed under, and then as we stopped to its south to take pictures at Sunset. We then continued south through yet another core, and another surprise: the southern part of the line we were passing through became tornado warned and was headed in our general direction! We piled through the north side of the core and stopped in Woodward for a quick dinner break and were off again and entertained by spectacular anvil crawling lightning all the way back to OKC. 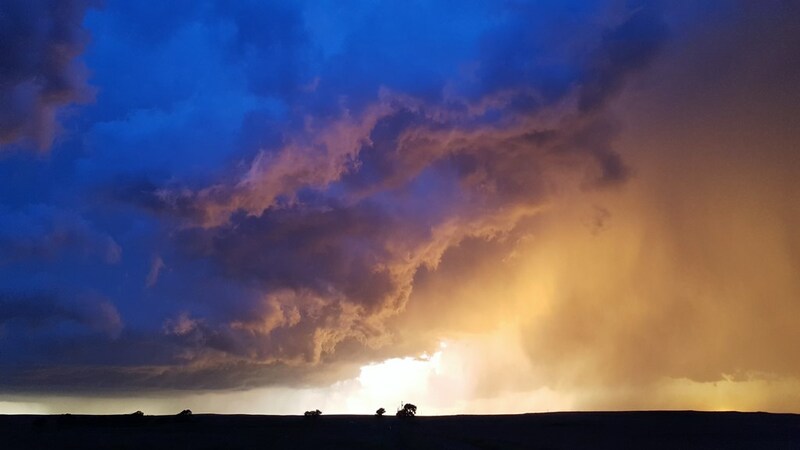 All in all, not a great day, but the surprise storm in the remoteness of Harper County was a treat in the end and the sunset and lightning show a nice end to the tour. And a fun tour it was! 19 tornadoes over a 4-consecutive day period is my new single year record, surpassing the 17 I saw in 2010, and I believe my total is now over 100 tornadoes witnessed. Miles for the day: 762. A long and frustrating chase day. With very little cap to prevent storms from firing all over the place. 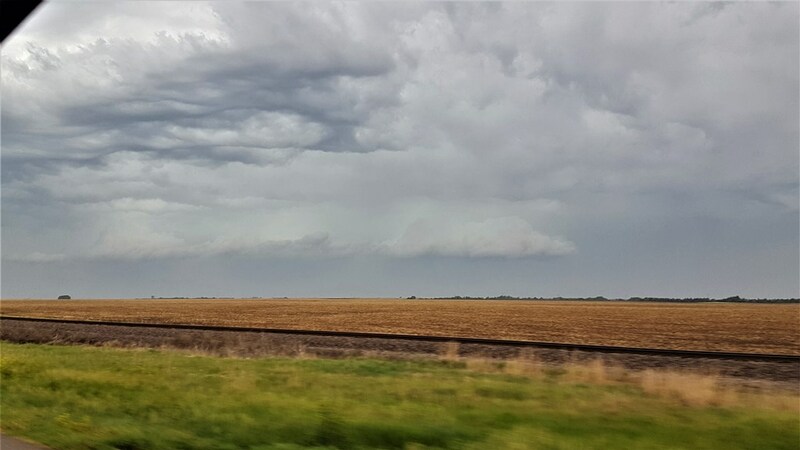 We ended up punching through some small hail storms near Hutchison, KS and ran into these linear storms near Mackville. Usually seeing a train on chase day brings us good luck! Not today though. Plowing towards Greensburg with a jumbled mess in front of us. Eventually we made it all the way over to Dodge City where a new series of storms started popping along the dry line and were a bit more isolated. There was so much cloud debris and cold air that despite some of them going tornado warned, they didn't stay isolated for long and lined out. Once the storms lined out we ended up under the "whale's mouth" of the storm, the shelf cloud, near Greensburg, which we passed through 3 times from different directions this day. Finally at the south end of the line, we stop to get a look at the storms and stretch our legs. All of the storms were undercut with cold outflow by this point. Big precipitation core to our west. Anvil cloud streaming off in the distance. Heading back to the hotel in OKC, we cross into Oklahoma and run into a big HP storm near Selman, OK What a mother ship! Ready to be beamed up! Fantastic colors and roiling motion as we pass under the shelf cloud. Awesome sunset! I did not edit this photo. The blue and orange contrast was fantastic! A fitting end to the tour. 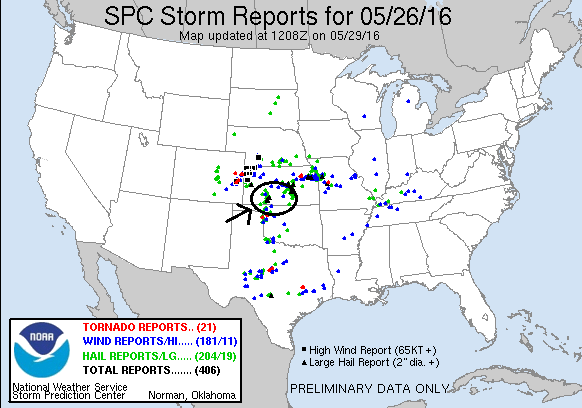 19 tornadoes, breaking my previous tour-record of 17. We stopped in Woodward, OK for dinner, then headed back into OKC, chased by this line of storms all the way.